Xiaomi has officially announced that it has started development of the MIUI 10 which is its own heavily modded version of the Android OS. The announcement was made at the annual Xiaomi's MIUI assembly meeting which took place on the 23rd of January 2018 in China. 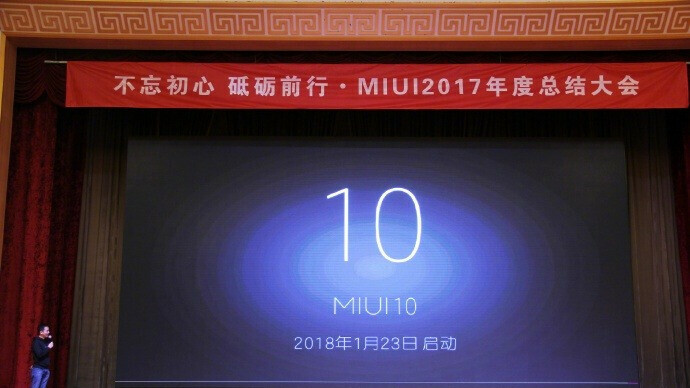 According to Hong Feng, who happens to be the co-founder, VP of Xiaomi and leader of its MIUI division, he said that the company's upcoming MIUI 10 will focus on bringing AI and machine learning features to users. The current MIUI 9 however is built around providing stability, smoothness, and better battery backup. Xiaomi hopes that its upcoming project will help to bridge the gap with other top smartphone manufacturers like Samsung, Apple and Huawei. Hong Feng has earlier mentioned in one of his previous interviews that the company is focusing more on expanding globally in the coming months. Xiaomi' MIUI is estimated to currently have over 280 million active users with about 20% which is around 56 million outside of China.